Forget everything you thought you knew about this budget-friendly kitchen surface and prepare to be impressed! Who said luxury had to break the bank? The innovative laminate countertops of modern day prove them wrong! If you’d love a new look for your kitchen, but don’t have the budget for a natural stone countertop—laminate just might be your new BFF. Get the high-end look of quartz or granite (at a far lower price-point) with laminate countertop designs that closely imitate natural stone. 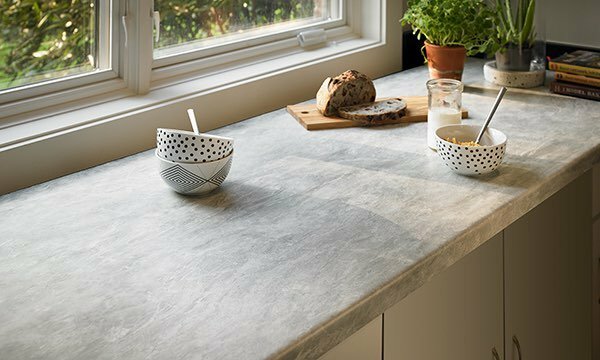 For those with great taste and a limited budget, you can affordably enhance your kitchen’s brilliant new look with a Wilsonart or Formica laminate kitchen countertop. Not all laminate is created equal. We proudly offer two brands of only the highest quality laminate surfaces. 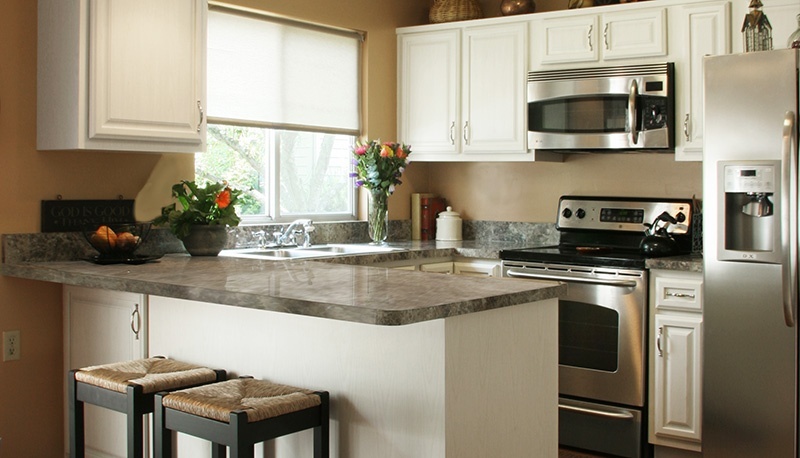 Laminate countertops boast a stylish and exclusive look at an affordable price. A countertop with just the right color or design can transform any kitchen into an oasis of style. Without investing too much money, you can easily turn your kitchen into an HGTV-worthy cooking and dining space. Even if you’ve already fallen in love with the look of quartz, granite, marble, concrete—laminate has an option for you. Advances in technology have made way for incredibly realistic designs, and they are plentiful! 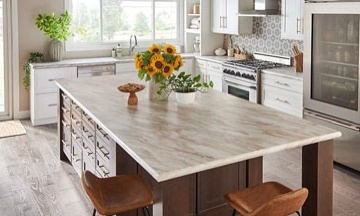 Laminate countertops can save up to 2/3 the cost of natural stone. It’s normal to have a budget when you remodel. Opting for budget-friendly laminate can mean having those other upgrades you've had on your mind. Laminate countertops take less time to install than their natural stone analogs. So you and your family can get back to normal and start enjoying your new kitchen. The maintenance required for laminate countertops is virtually effortless. They are super-easy to clean, without any special instructions or upkeep. However, bear in mind that sharp objects and extreme heat can harm your laminate countertop so always use cutting boards and hot plates when appropriate.